MONTREAL, May 15, 2014 /CNW/ - Yesterday, Wapikoni Mobile and the National Film Board of Canada (NFB) celebrated an important anniversary: 10 years of mediation and intervention through audiovisual creation with Aboriginal youth. On the very same site at the NFB where Wapikoni was launched in 2004, Wapikoni thanked its partners and highlighted the benefits as a result of their involvement. 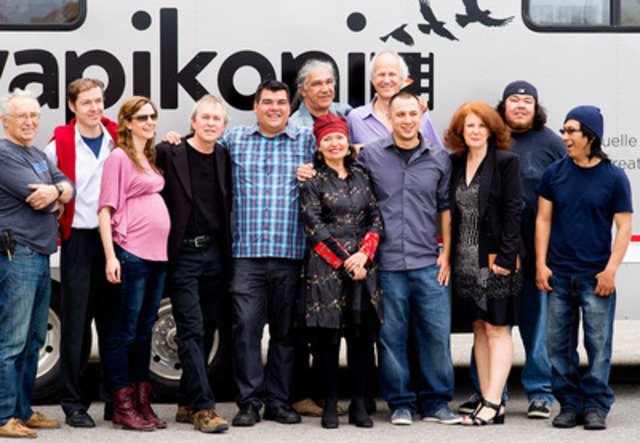 Prior to announcing the start of the 11th season and the official departure that very same day, having mobile studios in communities, Manon Barbeau, Wapikoni's Co-Founder and Director General, also paid tribute to Wapikoni Awashish, the inspiration of this great adventure. The event occurred with Deborah Drisdell, Director General, Accessibility and Digital Enterprises at the NFB, and André Picard, Director General of the NFB French Program from 2002 to 2004 both in attendance. A partner since the very beginning, the National Film Board has encouraged the development of Wapikoni and contributed to consolidating and making its numerous professional services accessible. "At the NFB, we are proud to have supported the beginnings of Wapikoni, faithful to our mission as being a spawning ground for talent and innovation support. We are delighted with its 10th anniversary and outstanding growth. Wapikoni has even become an example elsewhere in the world and it illustrates the richness and diversity of the creation of Aboriginal youth. This remarkable success must be highlighted in addition to Manon Barbeau and the whole team's continued commitment," said Deborah Drisdell. Alongside Samian, Wapikoni's spokesperson, and Kevin Papatie, Director from the Anishnabe community of Kitcisakik, Manon Barbeau paid tribute to Wapikoni Awashish as the emblematic figure who died in a car accident in 2002. The young woman was her close collaborator while Manon was writing a feature film with atikamekw youth of the Wemotaci community near La Tuque. "She was a radiant leader, full of life and plans for her community. Having her die while so many others took their own lives in Wemotaci appeared inconceivable to me. We ceased the film project and in its place we put our energy into designing the Wapikoni," stated Manon Barbeau. Finally, it was also an opportunity to inaugurate a brand-new mobile studio equipped with the latest digital technology. The trailer and new equipment were acquired through capital assistance from the Minister of Culture and Communications. Despite severe budget cuts in 2011, Wapikoni has survived the storm and has emerged stronger. Ten years after its inception, Wapikoni's mission continues to expand: Cross training to build bridges between First Nations youth in Ontario, Manitoba and Saskatchewan; partnerships developed internationally allowing participants to connect with their Aboriginal brothers and sisters around the world; workshops delivered using Wapikoni's methodology in Chili and Panama, as well as in Bolivia and Peru in collaboration with OXFAM Quebec and local partners. Wapikoni has reached over 3,000 young participants from 9 nations and 25 different communities. These youth have created ​​more than 600 short films and 450 musical interpretations. Their work has won 80 awards and accolades in prestigious national and international festivals. In 2012, Wapikoni received the Plural + Award Honorable Mention prize in New York from two UN agencies: the Alliance of Civilizations United Nations and the International Organization for Migration. In addition to the workshops Wapikoni offers in Aboriginal communities, it allows Aboriginal youth to break out of their usual surroundings and develop their empowerment and leadership skills by participating in numerous activities focused on awareness and intercommunity and intercultural exchanges. Dedicated to its promise, Wapikoni is going strong and will continue its mission in Aboriginal communities for years to come.